Also got a Westy version from 1973 somewhere. What does the little sticker on the base of the lamp say? It's a warning sticker not to put into incandescent sockets. SWEET! I have a few GE's in the red/white/black GE "HID" sleeves, H100A38-4/A23 order code, so likely 1979 back to maybe '77. I have some older Westy H38MP100/DX, too, used but nice and still pretty bright, lit one tonight in my 100 watt merc portable light made from a vintage hospital type floor lamp with a swivel reflector and night light! I added an advance postline ballast hose clamped to the stem of the amp just above the base. Works great! The Westy I lit tonight was last lit in 1998, so almost 20 years--God, time flies! It must have been dropped, and then installed, because the arc tube frame is crooked, and there is a hunk of loose glass in the bulb that, under vibration, wore a decent hole in the phosphors in base up, so it is kind of a clear end lamp but works fine! The light was on a switch and not often used, so the lamp has low hours. I have a second one without the bend frame, and it works fine, too! Plus I have NOS Philips versions from Home Cheapo. These are the US made ones, not the newer Chinese junk, so are lifeguards. This is an awesome lamp! I have a GE Hungary clear HR100A38/A23. Yes they made em that late. Cool lamp! Interesting sticker at the bottom. Cool! It's a clear MV lamp in a 150W incandescent bulb shape. 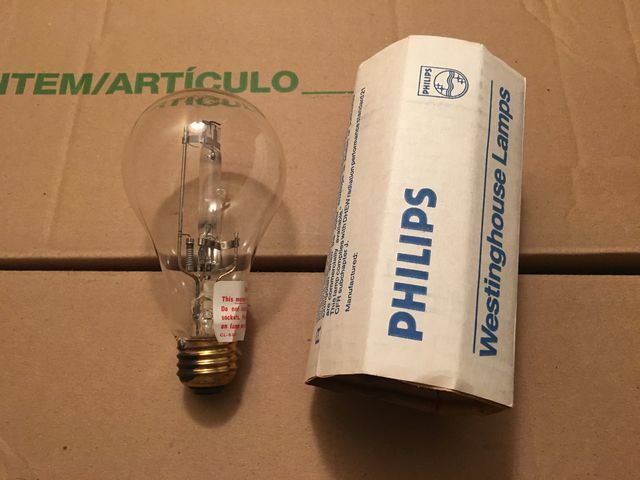 Cool, these A23 Shape Clear Mercury Lamps are very Rare, I wanted one for years and was lucky to get 3 GE HR100-A38/A23 versions from the USA 2 years ago.